Nelson’s father Ozzie was a big band leader and his wife Harriet, a big band vocalist who supported Red Skelton on his popular radio show. When Skelton was drafted in 1944, his producer John Guedel created a radio show around the couple and their family called The Adventures Of Ozzie And Harriet. The Nelson’s children were first played on the radio series by professional child actors until Dave and Ricky (aged 12 and 8 respectively) joined the show on February 20, 1949. Ricky didn’t have any inkling to make records until telling a girl he was trying to impress that he was going into the studio to cut his first record. At the time, he didn’t have a record contract, but he did have connections. Ricky’s father arranged for him to record Fats Domino’s “I’m Walkin’” for Verve records in 1957. Crucially, he then lip-synched the song on the TV show before the single came out, resulting in a #4 hit on the Billboard charts. Its flip side “A Teenager’s Romance” climbed all the way to #2 after he also performed it on the show. Nelson was one of the few fortunate artists who had a built in mechanism to get his songs heard by a mass audience through exposure on the family show which ran on TV from 1952 through 1966. After this success, Ozzie negotiated a long-term deal with Imperial Records for Ricky that gave him approval of what songs he would record and final say over sleeve artwork, which was unheard of at the time. His first single for the new label “Be Bop Baby” went on to sell over a million copies. While on Imperial, he scored hits with “Poor Little Fool” (#1 Pop/#3 Country), “Lonesome Town” (#7 Pop), “It’s Late” (#9 Pop), “Never Be Anyone Else But You” (#6 Pop), “Just A Little Too Much” (#9 Pop), “Sweeter Than You” (#9 Pop), “Travelin’ Man” (#1 Pop), “Hello Mary Lou” (#9 Pop), “Young World” (#5 Pop), “Teen Age Idol” (#5 Pop) and “For You” (#6 Pop), mostly propelled by his performances of the songs on TV. From 1957 to 1962, Nelson scored 30 Top-40 hits, more than any other artist except Elvis Presley who had 53, and Pat Boone with 38. For some, Nelson was the consummate teen idol with dreamy good looks and a smooth voice that sugar-coated the numerous gooey ballads he committed to wax. 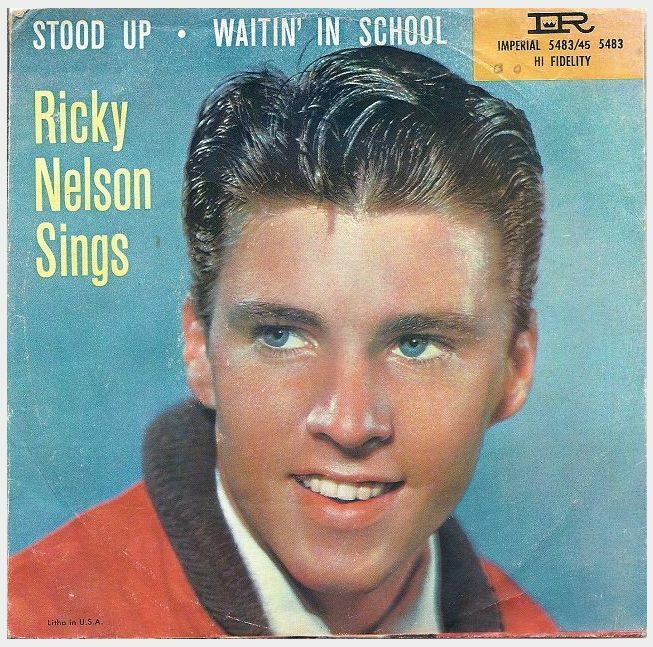 But today’s double shot of rockabilly illustrates that Nelson was so much more than just a teen idol. He was a way-out rockin’ cat whose backing band was also one of the hottest in the land. Early in his recording career, Nelson became fed up with the contemptuous attitude toward rock and roll of the jazz musicians his father chose for him to record with. In 1957 he formed one of the sturdiest bands of all time. He didn’t have to look far for his guitarist since his 18 year old friend James Burton was already living in his home. With the nimble-fingered Burton and his distinctive sound on electric guitar, he added James Kirkland on bass, Richie Frost on drums and Gene Garf on piano. Elvis Presley’s backup vocalists, The Jordanaires were also featured on Nelson’s recordings but they were not credited at Presley’s request. Today’s jukebox classic features two rockabilly blasts from 1958. The A-side “Stood Up,” climbed all the way to the #2 slot on the pop charts, while its flip, “Waitin’ In School,” which was written by Johnny and Dorsey Burnette, rose to #18. In 1963, Nelson signed a long-term deal with Decca Records. His Decca era produced some solidly great albums and singles, although his standing on the charts was dismal. 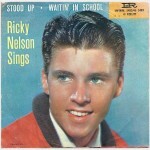 As the 1960s came to a close, you pretty much could not give a Rick Nelson record away. Things were so bad that Nelson began performing shows on the oldies circuit at county fairs. His last big single was “Garden Party” from 1972, which was about being an artist on the oldies circuit before his time. While performing at Madison Square Garden as part of a multi-act oldies bill, Nelson’s penchant for performing new material was met with boos from the audience. Disgusted by his audience’s expectations, he wrote “Garden Party” which when released climbed to #6 on the Billboard charts and topped the Adult Contemporary charts. Nelson died in a plane crash on New Year’s Eve in 1985. He was inducted to the Rock and Roll Hall Of Fame in 1987. Posted: May 17th, 2015 under Music, Rick Nelson, Rock.